e-mail: inuit at idc.minpaku.ac.jp *Please replace 'at' with @ and send. The purpose of this symposium is to compare and examine the results and current progress in research on and with indigenous cultures along the North Pacific Rim by inviting 15 domestic and international researchers. It is also intended that this symposium will be used as a basis for building a research network on indigenous cultures along the North Pacific Rim. In this symposium, the focus is on the current status of indigenous rights and utilization of marine resources. This symposium can be divided into three parts. 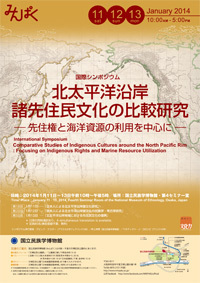 In the first part, Japanese researchers will report their current research results on indigenous cultures along the North Pacific Rim. In the second and third parts, current research results and the progress of joint-projects on indigenous cultures along the Northern Pacific Rim in U.S., Canada, and Russia will be discussed. Then, researchers from Japan, Canada, Europe and the U.S. will discuss establishing a research network on indigenous cultures around the Northern Pacific Rim. Saturday, January 11　"Indigenous Rights and Utilization of Marine Resources around the North Pacific Rim"
Sunday, January 12　"Comparative Studies of Indigenous Cultures around the North Pacific Rim"
Monday, January 13　"Joint-Research on Indigenous Cultures around the North Pacific Rim "
Time: 10:00 a.m. - 4:50 p.m.
Activities to (Re)acquire Sovereign Rights of Salmon Resource Management by Indigenous Societies along the Yukon River. 12:05 p.m. - 1:10 p.m.
What Do Yupiit Want to Protect in Claiming Subsistence Rights? 4:20 p.m. - 4:50 p.m.
Time: 10:00 a.m. - 4:45 p.m.
12:10 a.m. - 1:30 p.m.